Like a middle child, the Smart Fortwo Electric is clearly misunderstood. Why? Simply because most people are unrealistic as to the expectations of having a fully electric car. 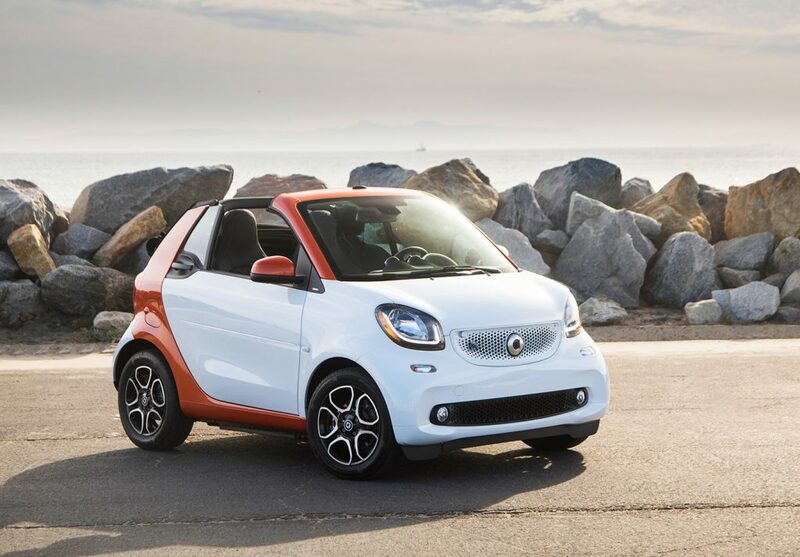 In reality, most of the daily needs can be done seamlessly by a car like the Smart Fortwo. The idea was for me to use only this car the entire week I had it and with its 57-mile range, it would be a challenge, or so I thought. My typical drive is a 20 mile each way work commute, throw in a couple of trips to lunch, dinner, the supermarket, a weekend drive to the local general aviation airport and of course, hanging out with my car buddies at the weekly cars and coffee in the uber-chic Wynwood neighborhood of Miami. It’s a lot of different driving, especially for a 57-mile range electric car. Read on and find out how it went. I’ll preface with a note stating that I am lucky that to have a multiple car garage in my house with electrical outlets, in addition to my office having a parking space next to an outlet. That made the big difference in how I could maximize the use of the Smart Fortwo Electric during my active week. The design is still a bit of a surprise to most people, primarily due to its diminutive size. The 2nd gen is a bit bolder and larger than the 1st one, yet still extremely small in the land of giant SUV’s. The model we tested is the Passion with the optional matte paint and black sporty wheels. 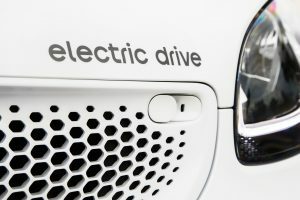 Approaching the Smart Fortwo Electric, you notice the size of the door relative to the rest of the car, its huge! Once you open it and sit inside, you are greeted with a surprisingly comfortable cabin. Seats, head and shoulder room is quite good and visibility is excellent. Switchgear, fit and finish is pretty good, although not as refined as in the Mercedes-Benz lineup. 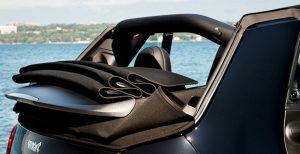 The Cabrio version we drove has an innovative quasi-convertible top that gives the occupants the great al-fresco feeling, yet keeping the rigidity and safety of a hard-top car. There are several detents during retraction of the top, the first is more like a sunroof, the second is like a traditional Italian rag-top and the third, which is at full extension, is almost convertible-like. Trunk space is big enough for a small grocery run or a typical weekend bag. Picture this, being first at a traffic light and the light turns green! Accelerating effortlessly and smartly (Excuse the pun) off the line, leaving pretty much everything in the dust up to 30-35 MPH. It’s that quick! After 260 miles driving for everything I did that week, I realized that the sweet spot for this car is exactly what most people do in their cars in a city, which is stop and go and drive under 45 MPH. Entering tight parking spaces, turning, or doing a full circle (22.8 feet turning radius) is actually fun, try that! Big SUV! Above 60-65 MPH (Top speed is limited to 81 MPH) the power consumption starts to go way up and range suffers greatly. We also noted that due to its very small wheel base, the ride can be a bit choppy over bumps. How is it driving on a crowded highway, full of inattentive texters and bored SUV drivers? Surprisingly a non-issue. Not once did I feel unsafe or intimidated by the larger cars around me. Quite the contrary, due to its superb maneuverability I could scoot in and out of traffic gaps incredibly easily. One last driving impression; even though the Smart Fortwo Electric does feel somewhat sporty, steering and brakes feedback is somewhat numb. I wish the wizards at Smart would dial-in a bit more feel, as this is a rather fun car to drive. A 240-volt Level II charger will make the biggest difference in the ownership experience. This size charging system will go from 0-100% charge in just 3 hours, otherwise, the 110-volt, standard wall socket charger, will take up to 16+ hrs to charge fully from zero. The key to owning this is to always plug-in (if available) wherever you go. It does take discipline and a bit of effort. I didn’t mind it at all. 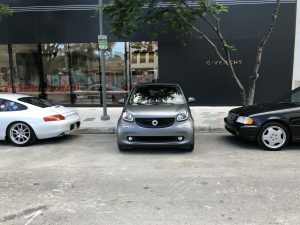 Lastly, for my weekly, Sunday morning cars and coffee event, I took the Smart Fortwo and parked it perpendicular to all the parallel parked cars there. That certainly made a statement. 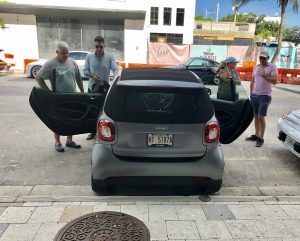 Most of the regulars came over and they wanted to poke around the Smart Fortwo, asking questions and being curious. I even took several for a spin and they came back amazed. Mind you, this is a jaded crowd, as most have gorgeous classic and specialty car collections and all are die-hard car enthusiasts. 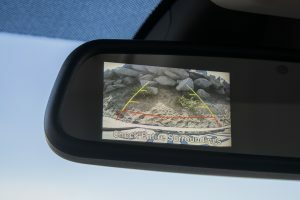 The Smart Fortwo took center stage for most of the two hours at the event and I was blown away by the level of interest it got. That was fun! 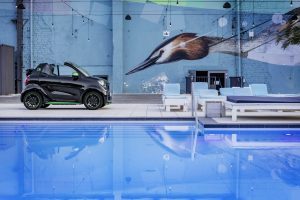 If you drive mainly around town, have a place to install a 240-volt charging system and don’t need to haul large things, the Smart Fortwo Electric may be a fun, eco-friendly alternative that is sure to put a smile on your face every time you drive it. Once you drive one you will clearly understand. Note: A longer range, (Up to 124 miles) model will be available later in 2018.